BOSTON (Sporting Alert, Box Score and Photos) — Jimmy Butler scored 22 points and Derrick Rose added 21 on his return from injury to help the Chicago Bulls to a 109-102 victory over the Boston Celtics on Friday. Chicago was beaten 106-101 when these two sides last met on Nov. 8. Butler, who finished with 10-for-12 from the charity line, knocked down a pair of free throws with 0:50 seconds remaining to give the Bulls (10-6) a 104-102 lead before Joakim Noah made a late 20-foot jumper to increase the advantage for the visitors at TD Garden. Rose played 28-minutes in his return from a hamstring injury and went 50-percent on 9-of-18 shooting from the floor, while Pau Gasol grabbed a double-double of 15 points and 15 rebounds for Chicago, who trailed the Celtics 91-85 heading into the fourth quarter. “The confidence is through the roof,” said Rose, who scored 12 of his total points in the third quarter where both teams netted 31 apiece. 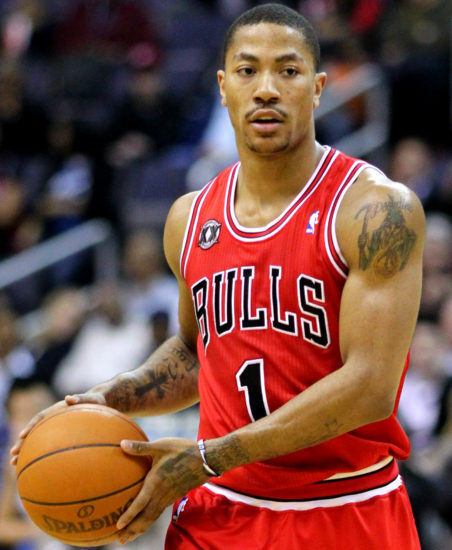 Chicago coach Tom Thibodeau said about Rose: “When he plays like that, it’s huge for our team. “When you look at his plus-minus when he’s on the floor for our team this year, it’s off the charts. Joakim Noah, also coming from knee and eye problems, had a balanced outing of 15 points, 14 rebounds, six assists and six blocks for the traveling Bulls, which out-rebounded the hosts 52-42 in the contest. They also collected 13 blocks against the Celtics’ two. Jared Sullinger paced Boston (4-9) with a game and season-high 23 points and 10 rebounds and he was supported by Avery Bradley, who added 18 points. Star point guard Rajon Rondo was restricted to eight-points, nine assists and seven rebounds in 33 minutes for the Celtics, which suffered its third defeat in a row and its sixth in the last seven games. Brandon Bass scored 16 points and nine rebound for Boston with Evan Turner finished with 13 points and Jeff Green 10 in the defeat. Boston was dropping its sixth game in eight at home this season. Aaron Brooks scored 15 and Nikola Mirotic collected 13 points, eight rebounds and five blocks in the victory for Chicago. The Celtics failed to connect from its opening six shot attempts in the final quarter and missed seven straight between 6:03 and 3:02. “I’m not going to lose any sleep over the ball not going into the basket,” Boston coach Brad Stevens said.